Today I’m sharing a fun look I pulled together inspired by New Year’s Eve. Shimmer, Glimmer, and Shine only make sense to represent the fun of the night and the shiny appeal of a fresh start. Enjoy! Tall sweater. Tall jeans. (or these if you’re afraid of shimmery jeans!) Wedges. Earrings. Clutch. Nail Polish. I am a fan of leopard prints and I especially love them in sweaters or cardigans. Enjoy today’s classy look. All Season Tall Trousers 36″ Inseam. Black Tote. Nine West Wedges. Amazon – order today to get Christmas delivery via Prime shipping, – choose one day as low as $2.99. or if not a member, upgrade to 2-day shipping for $13.81. Eddie Bauer – order via express plus delivery by 12/23 at 3 am ET for Christmas delivery. Many items are on sale too. Loft – order by 12/23 at 3pm ET for Christmas arrival. Choose next day shipping. Nordstrom orders can still arrive in time. See the shipping chart here. Westport Big & Tall – order by 12/23 by 2 pm to get overnight Christmas delivery. See details on site. Zappos – order by 3 pm ET on 12/23 for free overnight delivery. You may want to browse their gift guide for some ideas or look at our picks below. I thought it would be fun to show you a list of Tall Clothing Mall’s best selling items of 2015. Since I am affiliate of hundreds of stores, it’s easy for me to get data of all items that sell. I’ve gone back through my reports and pulled up the best sellers starting from January on. Since we all know that tall sizes are manufactured in limited quantities and are often not remade, some of the top items have sold out. So, I am listing items that are best sellers and still available for purchase. I was actually surprised at some of the items that made the list and noticed that men’s items were more popular on the repeat list than women’s items. Perhaps when men find something they love, they buy it in more than one color. You’ll notice that we sell lots of tall athletic pants. Here is the 15 top selling items of 2015. What do you think of this list? Did you find any surprises? You may not think shoes are not the most exciting gift to give. However, I just bet you know a shoe fanatic out there that would love to receive shoes for Christmas! Here’s our picks of shoes for Christmas. Flower Ballet Flats. Ugg Boots. Toms Slippers. Ankle Boots. Leopard Print Heels. Suede Flats. Ugg Slippers. Timberland Boots. Rockport Uppers. Need more gift ideas? Be sure to check out our gift guides. 9000 Facebook Fans!!! It’s time for a giveaway! Tall Clothing Mall just reached 9000 Facebook fans and I am so humbled and so grateful! The bonus is that it happened on #TallTuesday! In honor of all of you wonderful people, I’m in the mood for a giveaway! I’m giving away a $100 Nordstrom gift card. This contest will end next Tuesday Dec 15th at 11:59 MST as I want to give you time to use the gift card for Christmas. In order to enter the contest, you must enter via the widget below. The mandatory entry is that you must be one of our Facebook Fans. After you’ve clicked over to our Facebook page, you can get bonus entries via tweeting, commenting or following us on Pinterest. Good luck! We are having lots of fun creating gift guides for you. If you’re wanting a fail-proof gift, you’re going to love the items in this classic big & tall gift guide. The gifts below are ones that will be in style for years and will suit even the pickiest of guys. Plaid Scarf. V-Neck Big & Tall Sweater. Commuter Gloves. Kiehl’s Facial Care Set. Ray-Ban Sunglasses. Michael Kors Big & Tall Leather Jacket. Weekender Bag. Baseball Cap. iPhone Wallet. Slippers. If you haven’t picked up any gifts for tall women, we’ve got you covered. Today’s gift guide is for trendy tall women. These women know that all eyes turn toward them when they enter the room and they loves to create a great first impression. They are confident and everyone can see it! Leopard Print Foldable Flats to size 14. Tall Faux Fur Coat. Tall Ponte Knit Pants – 35″ Inseam. Tall Cardigan. Sam Edelman Tote. Blanket Scarf. Clinique Makeup Set. Tall Jumpsuit – 37″ Inseam. Sony Smartwatch. Fairisle Tall Wrap Skirt. Ray Ban Sunglasses. Zip Tall Vest. Here’s a new one – tall tuxedo vest. Unfortunately all of the tall tuxedo pants I can find are cropped. Women’s Tuxedo Pants – inseam unknown, but choose the UL sizes for “tall sizes”. May need to go up a size or two for US sizes. Unfinished tuxedo pants and in plus size too. These run extra long according to the comments. I hope I’d help you find some items to dress up your wardrobe this holiday season. 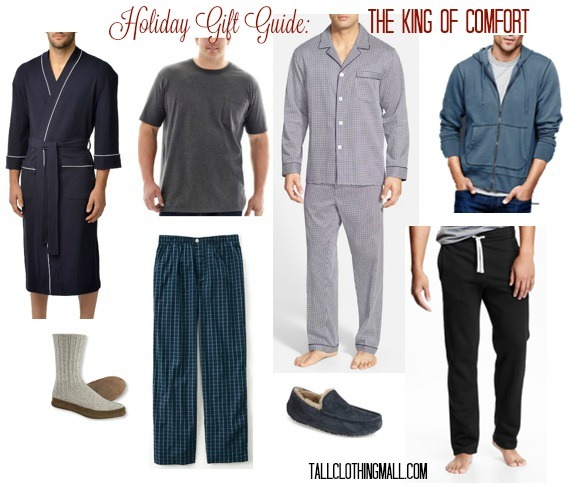 Today I’m sharing a round up of gifts for the tall comfort lover in your life. From tall sweats to tall pajamas to Slipper Socks, there’s something for anyone who likes to feel comfortable and cozy. Enjoy! Tall Sweats. or try these.